~One of Dravid's most debated decisions was taken in March 2004, when he was standing in as captain for an injured Sourav Ganguly. The Indian first innings was declared at a point when Sachin Tendulkar was at 194 with 16 overs remaining on Day 2. ~Rahul Dravid has had a mixed record when leading India in Tests. India lost the Karachi Test in 2006, giving Pakistan the series 1-0. In March 2006, India lost the Mumbai Test, giving England its first Test victory in India since 1985, enabling Flintoff's men to draw the series 1-1. While the loss in Karachi could be put down to several Indian batsmen playing badly, the defeat in Mumbai was arguably the result of Dravid's decision to bowl first on a flat dry pitch which later deteriorated and ended with an Indian collapse in the run chase. ~After India failed to qualify for the Finals of the DLF Cup, Indian skipper Rahul Dravid was criticised by former all-rounder Ravi Shastri who said that he was not assertive enough and let Greg Chappell make too many decisions. 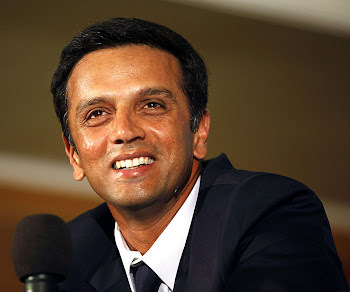 When asked for a response, Dravid said that Shastri, while a 'fair critic', was 'not privy' to the internal decision-making process of the team. ~Under his captaincy, India exited from the World Cup in the first round itself.